The Fresno ARS Juniors Chapter was organized in 1952 by a long-time ARS members Victoria Gostanian. Gostanian was an intellectual and respected leader, with foresight and dedication to serve the community, whose call to duty was responded by college-age young ladies. The nucleus of the fledging chapter consisted of Larissa Abrahamian, Rose Jamushian, Sima Kaprielian, Nazik Kotcholosian, Vartiter Kocholosian, Virginia Maralian and Rose Sarkisian. As members matured and were no longer juniors, there was a need to change the chapter name. Thus, in 1968, the ARS Juniors was changed to ARS Sophia Chapter, in honor of the great philanthropist and ARS benefactor Sophia Hagopian. The chapter opened a new page in Fresno’s cultural life, by participating in programs (“Hantesses”) with recitations, songs, instrumental music, dances and theatrical skits. The authentic Armenian Folkdance group revitalized the community and established a missing vital cultural link with Los Angeles and San Francisco, as well as with the Fresno community-at-large, by live and TV performances. 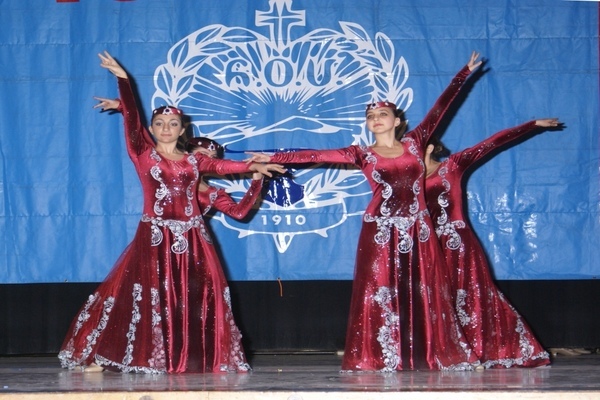 Later on, ARS members as teachers in the school district, were able to introduce the subject of Armenian culture as instructional units in their respective schools. Armenian heritage exhibits appeared for the first time in Fresno’s schools and at the California State University, Fresno (CSU Fresno). The Sophia Chapter has organized various cultural exhibits, including special exhibits on the occasion of the Commemoration of the Armenian Genocide (April 24) at the Fresno County and the CSU Fresno Libraries; exhibit of Armenian historical costumes at the Fresno Metropolitan Museum, the historical Kearney Mansion sponsored by the Fresno Historical Society; and an Armenian heritage exhibit at the Fresno Unified School District. The school district exhibit allowed hundreds of students and their teachers to be exposed to the Armenian culture. For several years during the early 1970ies, with the cooperation of the Fresno Adult School, the chapter offered English and U.S. Citizenship classes to Armenian newcomers. One of the outstanding projects of the Sophia Chapter was the reproduction of the historical Armenian costumes, which were sewn and made by members. These costumes were exhibited at many breathtaking fashion shows that dazzled and pleased many audiences in major cities in California. The culmination of this successful project was the publication of “Armenian Costumes Through the Centuries”. The book contains beautiful color photographs with historical narrations in Armenian, English and French. Sophia Chapter takes pride in respecting and caring for the elderly residing at the California Armenian Home. Periodic visitations have been organized by the members each year since the mid 1970-ies. For each visit, something different is prepared and shared with the residents, such as traditional Armenian food, music, dancing, lap blankets, and booties prepared by members. Annual health fairs are organized by the chapter in collaboration with the St. Agnes Hospital of Fresno for the benefit of members and the community. These seminars have proven to be very educational and have been well received by the attendees. Sophia Chapter provides financial assistance to the Armenian Community School of Fresno, and scholarships to students. Scholarships are given to deserving Armenian students entering college. The chapter also contributes to various non-Armenian charities. The chapter continues to actively recruit new members, keeps the ARS traditions alive and continues the journey that Armenian women have begun generations ago, with the hope of passing the ARS legacy of service to future generations.